The new issue of the Automotive News Europe monthly e-magazine goes live on Monday, Nov. 4. 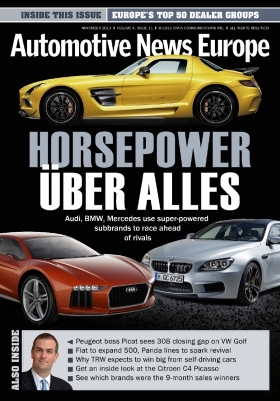 This edition looks at a battle between Audi, BMW and Mercedes-Benz that goes beyond unit sales. The German automakers are constantly trying to out-engineer one another with their high-performance subbrands. The grand prize for horsepower supremacy, break-neck acceleration and leading-edge technology is a small but affluent group of enthusiast car buyers who will pay a premium for the super-powered cars. This year Audi’s RS, BMW’s M and Mercedes’s AMG models will account for about 70,000 sales globally. On average, the buyers will pay 100,000 to 150,000 euros. That means these models pack a powerful punch when it comes to profit margins. We look at each subbrand’s expansion plan. From Germany we move to Paris, where two French CEOs are using very different strategies to move their volume brands upscale. Rather than adding a near-premium subbrand or creating a dedicated upscale model line, Peugeot CEO Maxime Picat told us he wants to squeeze more profits out of its existing lineup by adding higher-end versions to each model line. Meanwhile, Citroen CEO Frederic Banzet told us he wants the automaker’s C-line of practical, easy-to-use models to match the success of its strong-selling DS upscale subbrand. We have interviews with both executives. Fiat aims to win back customers to its core brand with a two-pronged model strategy for the upper and lower ends of the mass-market. We look at how the Fiat Panda and 500 model lines are likely to be expanded from a combined four minicar variants to 12 derivatives that cover the minicar, subcompact and compact segments. Also inside, we explain why young Chinese businesswomen are the driving force behind Maserati’s fast-growing order book; tell you how Suzuki plans to increase its European sales by 50 percent; and reveal our annual ranking of Europe’s 50 largest independent dealer groups. On the supplier side, Getrag CEO Mihir Kotecha tells us how the German transmission maker will nearly double production to 6.9 million units while TRW executive Peter Lake explains how the safety specialist will benefit from the move toward autonomous driving. On the new product side, our expanded and improved Latest Launches section provides key details on the Alfa 4C, BMW X5, Suzuki SX4 S-Cross and Skoda Rapid Spaceback. We wrap up this month’s issue with great news for auto stock investors: all sectors of the industry – automakers, suppliers and retailers – recorded strong gains in shareholder value in the third quarter this year, as measured by the Automotive News Europe/PricewaterhouseCoopers Transaction Services Shareholder Value Indices. The e-magazine is available to read on our Web site at www.autonewseurope.com, as well as on our iPhone and iPad apps. You can also download the magazine to your computer, tablet and phone as a PDF.